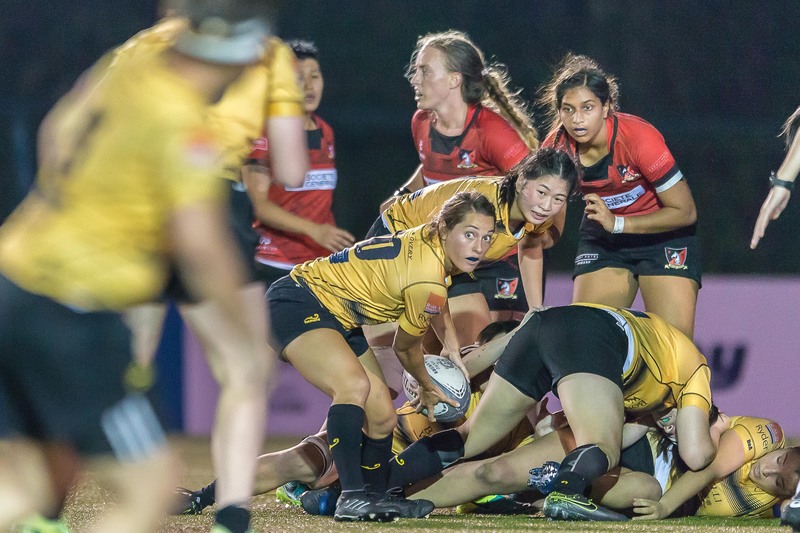 The KPMG Women’s Premiership returned with a bang after Hong Kong’s demanding tour of Spain and Wales earlier this month, with Borrelli Walsh USRC Tigers making a statement win last weekend over league and Grand Champions, Gai Wu, 34-5. The action is set to intensify further in tomorrow’s penultimate outing for the eight sides before the league splits into separate four-team Premiership and Premiership A competitions. Tigers will press their claim for sole possession of second place against SCAA First Pacific Causeway Bay at the Education University of Hong Kong (17.00), while Gai Wu will meet Transact 24 Tai Po Dragons at KGV (16.30). Societe Generale Valley play Kerry Hotel Kowloon at King’s Park while Plastic Free Seas City Sparkle play Natixis HKFC at Shek Kip Mei, with both matches kicking off at 18.00. Tigers eviscerated the Falcons last weekend, jumping out to a 20-0 lead in the opening 30 minutes before adding a fifth try before half time. A proud Falcons outfit improved as the minutes wore on, allowing only one more try in the second half, but Gai Wu’s attack was stuck in neutral and could only muster a late consolation score. It was a magic outing for Tigers coach Fan Shun-kei, particularly as it represented the first chance this season for him to run out the club’s impressive combined international strength after the conclusion of the Asian Sevens series and November tests in recent weeks. Tigers were even able to blood a few promising Hong Kong U18s sevens players against Gai Wu. “Our national girls haven’t been with us for basically the entire first round, so against Gai Wu we really wanted to try to integrate the full squad, including our national players, some transfers from other clubs, and even some of the U18s players. “It is going quite well after the first run,” said a delighted Fan. The only drawback from the win was an injury to Hong Kong flanker Maggie Au-yeung, which will likely keep her sidelined until next spring. For Fan, who also coaches the highly successful Hong Kong U20s men’s sevens team, the early returns from the women’s tour to Europe, during which 14 new players were capped, are already being seen, particularly amongst his new capped charges. Gai Wu’s first loss of the season has altered the look of the table, apart from the top spot, which is firmly held by the only remaining undefeated side, Valley, on 25 points. With two games remaining, Tigers have drawn level with Gai Wu, tied-second on 20 points - five off the leaders but safe from relegation, while surprise packets Kowloon currently occupy the crucial fourth spot, with a 3-2 record and 15 points - one ahead of chasers SCAA First Pacific Causeway Bay. All eyes will be on both of these sides down the stretch, but tomorrow’s match against Valley will pose a severe test of Kowloon’s hold on fourth, while Causeway Bay face their own moving day challenge against in-form Tigers. If present form holds true, it could all come down to a winner-take-all battle on 8 December when Kowloon and Causeway Bay meet, overshadowing even the traditional clash of titans on the same weekend when Gai Wu and Valley reprise last season’s grand championship finale. On the eve of the final matches of the first round at least one club is hunting for more. “Valley have probably cleaned up the first round, but hopefully we will challenge them in the next round. We are targeting the League championship this season, because the girls are now ready. We have been developing them for two years and now they are starting to perform,” said Fan. “We have depth now and everyone is hungry for rugby off the bench and to crack the starting line-up. “The biggest takeaway from Gai Wu is that we believe in ourselves and know we can beat Gai Wu and Valley. “We just need to continue to execute our game plan, keep our attack sharp, just keep going really and stay injury free for the back half of the season,” Fan added. Natixis HKFC, Transact 24 Taipo Dragons and Plastic Free Seas City Sparkle prop up the table’s base and will be shifting focus to their hunt for the Premiership A title after the turn of the year.